Well technically one, but who is counting? Now there was a tradition, here at '28mm Victorian Warfare' of painting up a miniature that tied in, albeit it very loosely, to the most recently completely page turner to have graced the bedside table. Well with the completion of thoroughly enjoyable 'Radio Hope' by Sean McLachlan it seemed only fitting that something Post Apocalyptic was promoted to the painting table. Now I had hoped that this would have been in the form of some very interesting scavenger types that I had spied over at 'Black Cat Bases', but sadly things are obviously still not right there. When my previous order finally turned up it came with a discount by way of an apology, a nice touch and not necessary given the unfortunate family circumstances that seem to have befallen them. I decided to continue to show support by redeeming said voucher only to find that the order had taken so long to arrive that the voucher had expired! Not to worry, thinks I, I will just simply place another order, after all they do have some wonderful items on their list - that was over three months ago. 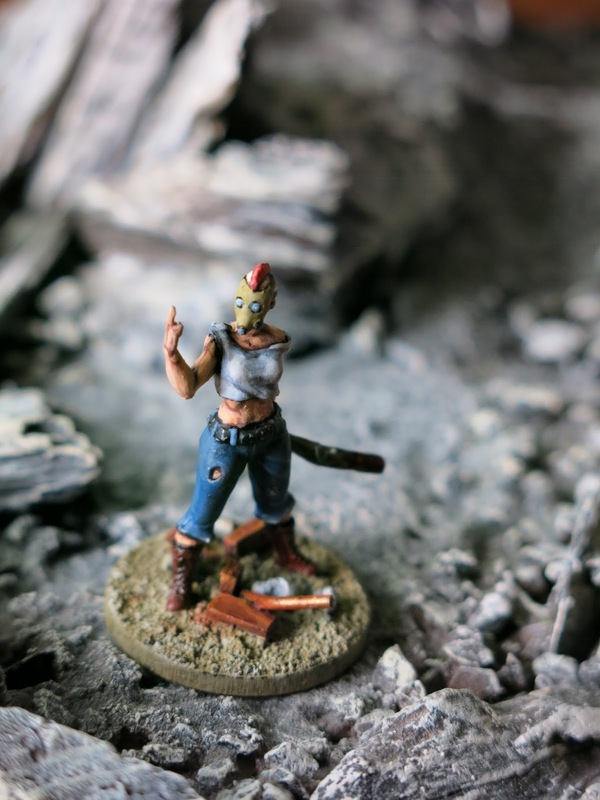 It then occurred to me that I had a possible stand-in for a wasteland wanderer in the shape of this delightful miniature. This was a freebie from that splendid chap, the 'Dark Templar' and was one of the preproduction sculpts for the game he had been working on 'Aetherium'. Even though this was not not the finished article, so to speak, there were so lovely touches, including tread on the soles of her boots - now there's attention to detail! The plastic was a little bit fiddly to work with and although I had washed the miniature in detergent first it still seemed to resist the application of acrylic primer that I was using. In the end, I resorted to giving it a coat of matt varnish to allow the paint some form of key, obviously this would not have helped the delicate details, but there was still plenty left to work with. A fairly predictable colour palette with a nod to all things punk including the addition of some cherry red Dr. Martens and a studded leather belt. I had pinned her to a 'Warbases' MDF disc, which allowed me to have a little fun with the debris of a forgotten world strewn about the place and ultimately I'm pleased with how she turned out - a timely reminder to myself that I had backed yet another Kickstarter in the shape of 'Across the Dead Earth'; Expect more of this later in year! She's got plenty of attitude. Well done! 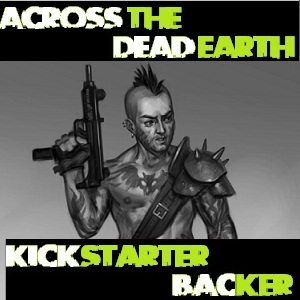 Oh no not another "Across the dead Earth!" I can see myself getting sucked into this from Simon (Brummie) but now with your fine painting I don't feel I have much choice! Looks great, love the 'head'...and enjoy! really good... well, nasty... well, you know what i mean! Very nice indeed. Enjoy the break! What a lovely finger!! Great work here Michael and enjoy the time with your family! Nice work Michael. I think you should call her Judy, because the Ramones told us that "Judy is a punk". RIP Tommy Ramone - gone to join the others at the great CBGBs in the sky. She is a great figure beautifully painted! One should always be mindful of a girl who knows how to swing a bat. I'm resisting Across the dead earth and you guys can't make me jump in though if you & Simon keep this up you probably will. Cracking job sir. Classic PA combo of gasmask and mohawk. So another "dead earther" rears his head. I'm not sold on the game as much as I want to use the figures as survivors in my zombie apocalypse. Nicely done Michael, she could likely work for a tricked out Zombicide character as well, perhaps the Masked Batter! Of course all this mowhawks & facemasks makes me think of the Road Warrior. Brutal and lovely! She swings so hard she bent the bat. A great looking figure, I to looking forward to ATDE. Great figure and beautiful paint work as always. Nicely painted miniature. Very good and interesting! Splendid looing figure! The paintjob is simply awesome. interest post ~ I would of gone for a pva/water dilute solution over the figure (as I normally do with resins) to help the paint adhere to the miniature, but your method obviously works; as proved by your great paint job. Oh my! Looks like she means business! Simple yet effective. I especially like the blood on the dented metal bat. She's a stunner! (and then a chopper-upper..). Very nice. A shame you've fallen foul of Black Cat - my unfulfilled order celebrated its first birthday recently. My kinda gal! Nice work, chumrade! I'm well Jeal that is an awesome miniature! Great paint work sir!